BUCHI Labortechnik has announced the release of a new flexible and high-speed extraction line with smartly designed safety features. The newly launched products include a fully automated extraction unit designed for the most challenging extraction tasks in residue and contaminant analysis, natural products research and analysis of polymers and materials. The second instrument is specialised in quick and reliable fat extraction. In combination with the new hydrolysis unit with a sample preparation step for fat extraction, BUCHI can offer a fully compliant solution for the most dependable fat determination in food and feed. Director of BU food and feed at BUCHI Vahé Iplikci said: “Extraction is a standard sample preparation step for a myriad of applications, so having the flexibility to quickly and reliably meet requirements for different extraction methods, solvents and process parameters can be difficult. 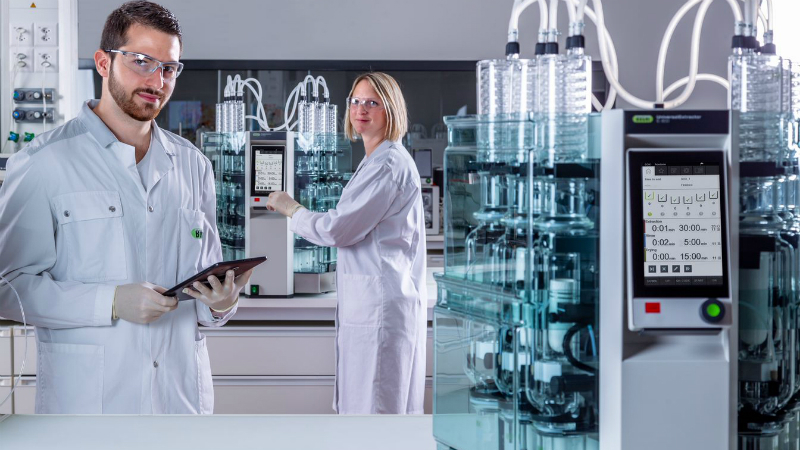 The new fully automated extractors perform the fastest and most reproducible extraction processes with full compliance. The extraction time is only a fraction of those of traditional glass set-ups or other solvent extraction units on the market thanks to specialised glass assemblies, high-speed heaters and sophisticated process control. Iplikci added: “The new line meets the highest safety standards for minimal solvent exposure to ensure safe and environmental friendly extractions. The UniversalExtractor E-800 sets new standards for universal extraction tasks in the pharmaceutical, chemical, food and feed industries. The system combines compliant extraction methods Soxhlet, hot extraction (HE), Twisselmann (ECE), Soxhlet warm and continuous flow in one universal glass-assembly. The product enables more multitasking possibilities, faster method development and higher sample throughput. The FatExtractor E-500 is specifically designed for quick and compliant fat determination. The FatExtractor E-500 readily complies with standard methods such as Soxhlet, HE or ECE. HydrolEx H-506 offers a smooth acid hydrolysis process and perfectly complements the FatExtractor E-500 with easy sample transfer between the two systems. The new extraction units join BUCHI’s existing portfolio for complete proximate analysis with Kjeldahl and near-infrared (NIR) solutions. The company’s solutions include innovative products for the entire process workflow, personalised support, easy-to-use data management and professional maintenance. The company aims to satisfy its growing global customer base by continuing to understand specific demands and by designing solutions that fully meet and exceed customers’ high expectations.